Run the downloaded file and follow the on-screen instructions. The default installation path is C:\Program Files\ZET 9\. Do not use system folder "Program Files (x86)" with Windows Vista, 7, 8, 10... , but use e.g. "D:\ZET 9\". The program is about ready to use. Run it from the "ZET 9" shortcut on the Desktop. Do not use ZET in maximized mode with Windows, 7, 8, it may dramatically reduces computer speed (but the full-screen mode is allowed). 1. Download the Windows Virtual PC from Microsoft web-site and install "Windows XP Mode". 2. Install ZET to virtual Windows XP, which appears in the system. 3. Move ZET shortcut to "All Users: catalog. 4. Run ZET from "Start" menu. If you have any problems while running ZET, see here. If you use Chineze, Japaneze or Korean language, then set a "^" degree glyph instead of "circle" one. To do that click "Settings" button, select "General settings", "Misc." tab, click "^" degree symbol option. If you cannot run ZET for the first time after installation, then download ChinezeMainINI.zip, extract Main.ini file, and replace existing one in ZET folder. You may need to adjust the size of chart elements. See Chart Settings, "Size". 6. Select the line "WinstarTT", and click "OK"
You should now be able to use this font in the program. Install current updates (see "Help" button, "Update ZET" menu item). See "Additional Files" chapter below. ZET runs perfectly on OS X Mavericks. ZET 9 runs fine on a mac using a windows wrapper. That's it. Launch zet 9.app and zet should start and behave as in windows. The update is intended to correct the program. The need for correction of program errors, and when the program features are added. The update releases are numbered. Watch out for them and try to set them on a regular basis. You can see description of the updates on the News page. upd120609.rar Updating "Planet textures" of 9 June 2012.
upd120610-e.rar Updating of user guide of 10 June 2012.
upd120708.rar "Font_16_B1.zfn" font, larger, than standard "Font.zfn". Select it by "Chart Settings", "Font", "ZET Font", "...". It is thus recommended to choose the corresponding size of fonts of planet's list and texts. See a screenshot of ZET on Windows 7 in a "Large text" mode ("Control panel", "Registration and personalisation", "Screen"). upd140202.rar Update of files of 2 February 2014.
upd140422.rar Update of files of 22 April 2014.
upd140704.rar Update of files of 4 July 2014.
upd140817.rar Update of user manual and interface of 17 August 2014.
upd140909.rar Update of interface of 9 September 2014.
upd141025.rar Update of interface (messages) of 25 October 2014.
upd150222.rar Update of time zone tables of 22 February 2015.
upd150226.rar Update of Atlas of 26 February 2015.
upd150530.rar Update of files 30 May 2015.
upd150820.rar Update of files 20 August 2015. Interpretation text "Engl. Planet_in_House.rar". Put it in [ZET 9]\LANGUAGE\English\Txt folder. upd161122.rar Update of Atlas of 22 November 2016. Reload ZET after that..
upd170811.rar Update of Chile time zones tables of 11 August 2017. Reload ZET after that. Swiss Ephemeris calculation module (dll) release 2.05 swewin32_205.zip unpack to [ZET 9] folder when program closed. The old version of the module here swedll32.2.01.rar. See current installed version of the calculation module in "Help - About". Open the file-archive, will appears a window with a list of lines and folders, which contained in this archive. Unpack all these files and folders directly to ZET 9 folder, e.g. C:\Program Files\ZET 9\. Open utility (zetunrar.exe in ZET 9 folder), will appears the list of RAR-files, located in ZET 9 folder. Check the archive-files you need in the list and click "Unpack" button. When unpack the professional update, you will asked to enter password for the encrypted file. Enter the password of professional access. Run ZET. On the splash-screen you can see the release number and date, e.g., 9.1.63.20513 means Version 9, Release 163 of 13 May 2012. You may read about professional ZET versions Pro and Geo at the ZET features page. 1) Purchase a Registration Key for the ZET version you require (see the Registration page). 2) I will send you by email the necessary Internet links and passwords. 3) Download your key file. Install it: open and follow dialog. You will asked to input the password of your key. During installation a little black window blinks. 5) For ZET Geo modification: Download the topographical map installer. Open it and follow dialog. While installation you should specify a path to ZET 9 folder, which you choose while step 4. 6) Run ZET by double click ZET shortcut on a decktop. 7) When ZET runs, press F1 key and read user manual. See also the User Instruction for installation ZET Professional. aspack2.zip - The aspect tables package for the study of directions, for quicker recognition of common age factors as used in directions, it allows one to see into the harmonic without changing the 'harmonic chart' on the 'zodiac' tab (by Dion van Zyl). Unzip to [ZET 9]\ASPECTS\ folder. 6 KB in size. Set of Lots of Hellenistic Astrology Greek_Lots.zip, unpack to [ZET]\PARSES\ folder. Also two sets of lots (sent Paul Hysen) parts_PH.zip. DBaseFamous.zip - The Database of famous persons with photos, sorted by rising sign. 6074 KB in size. - Font0310.zip, contains a variant of ZET font with more bigger glyphs (Font0310.zfn file). - FontSD.zip, contains a variant of ZET font (file FontSD.zfn) and asteroids gliphs file (AsterFont.dat). Created by Sergey Dmitriev. Before unzipping you can rename existing AsterFont.dat file, if you wish to safe it. - Zastro Joytish Fine - same as Zastro Joytish, except that the images are in the form of line drawings. - ZastroMD has medieval representations of the zodiac. 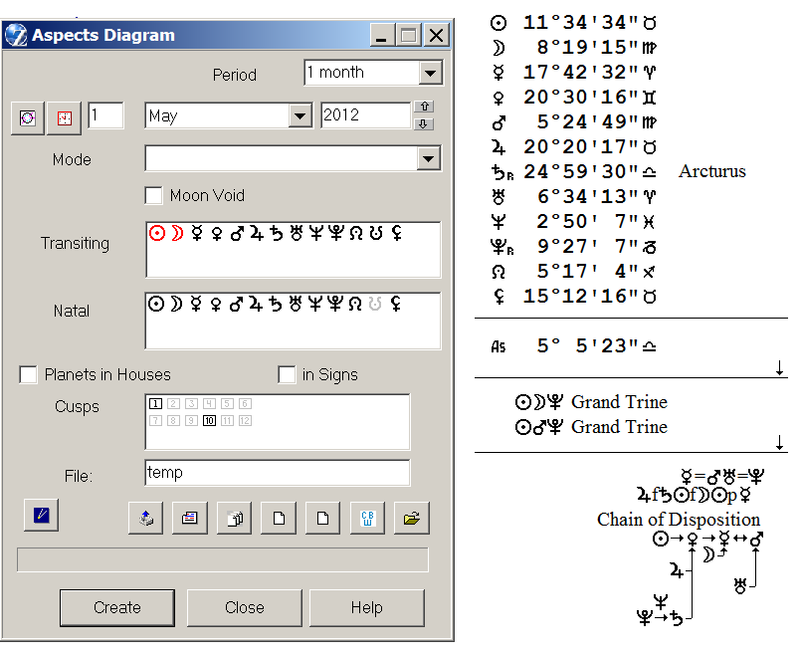 ZET_Chinese_Fonts.ZIP - 3 astrological fonts of Chinese style. How to install fonts see Q&A. After unzipping, a selection of .wav files should appear in the "Sounds" folder. To turn sound effects on, select the option in the General Settings window. HIPPARCOS.exe, (12.07.2005) 2 282 KB. This star catalog enables the Cosmos and Sky tableaux in ZET to display 200000 stars. Natal Fixed Stars.zip, (16.06.2016) 48 KB. By Paul Hysen. TEXTMAPS.zip, (4 April 2010, 48 MB). For the Cosmos tableau, to display photorealistic images of planet and satellite surfaces. Adds files to [ZET]\TEXTMAPS folder. If you have ZET Geo modification and path to this folder redirected, then copy (move) new files manually to folder of redirection. VenusTx.rar update of 10 June 2012, 43 KB. "Natal Fixed Stars", unpack to [ZET9]\LANGUAGE\English\Txt\ folder. The installer for ZET Lite contains ephemeris which calculates precisely positions of the planets and main asteroids only in time range from 1800 to 2399. If you want a greater range (from 12998 BC to 16799 AD), you can additinally download Swiss.rar 96.3 MB in size, when unziping specify path to [ZET]\Swiss\ folder. Asteroids.zip (15 Aug 2013) 400 KB, Aster.dat file - list of 11200 named asteroids. Extract to the main ZET folder. This list contains average orbital parameters of asteroids. To calculate asteroids' positions with higher accuracy, you can download Swiss ephemeris data for specific asteroids from www.astro.com into the [ZET]\Swiss folder. See the User Manual for instructions. The time calculator is a small program which converts calendar dates to astronomical Julian Days and vice versa, and can also calculate the difference between any two dates as a number of years, days, etc. Download (197 KB). Runs from ZET, see "Tools" button, "Time Calculator" item. AstroPhoto.exe 3 627 KB, ZET astronomical photo-album. Planets-H.zip 172 KB, Small collection of astronomy pictures for ZET astronomical photo-album. Unzip to [ZET]\Jpg folder. Pictures.zip 370 KB, pictures by Boris Vallejo. After unzipping, the [ZET]\Pictures folder should contain additional JPG files. The illustrations can be displayed by selecting "View" in the pop-up menu of a planet or Zodiac sign, and from the Constellation window menu. Korean GUI for ZET 9, prepared by Namgon Kim (Seoul, Korea), ask him via email "namgon2 at hanmail.net". Italian.zip -- Italian language module, release 27.02.2015 by Franco R., 65165 bytes in size. Persian Language Pack for ZET 9 release 4.04.2015 by Edris Peiman. *.ini files from [ZET]\LANGUAGE\English\Config\ folder - ZET configuration files. Orb tables (*.asp files) in [ZET]\ASPECTS\ folder.